Mimosa hostilis, or M. tenuiflora, depending on the classification system, is a native of Mexico and Brazil and a member of the legume family. This is a perennial flowering shrub that grows to 13 feet in height and thrives in dry desert areas. Grown as an ornamental, it offers a soft accent in the garden, with feathery foliage and fragrant white flowers. When working with the mature mimosa hostilis, wear gloves because the branches are equipped with large thorns. Place the mimosa seed in a bowl and pour hot tap water over it. Allow the seed to soak in the water for 24 hours. Mix equal parts of sand and perlite and pour it into the planting pot. Moisten the soil until it is soaked and allow it to drain completely. Push the mimosa seed 1 inch into the soil and place the pot in a sunny area, on a heat mat set to 75 degrees F. If the room temperature remains near 75 degrees F, the heat mat is not necessary. Keep the soil moist until the seed sprouts, which should occur within six weeks. Transplant the mimosa hostilis tree into a deeper pot when it reaches 5 inches in height. Use equal parts of standard potting soil and sand, and plant it at the same depth at which it has been growing. Place the pot in a sunny area, either indoors or out, and allow the top 2 inches of soil to dry prior to watering. Plant the mimosa tree into the landscape when it has reached 1 foot in height. Choose a sunny location and plant it at the same depth as it has been growing. Water the mimosa tree when the top 4 inches of soil are dry. 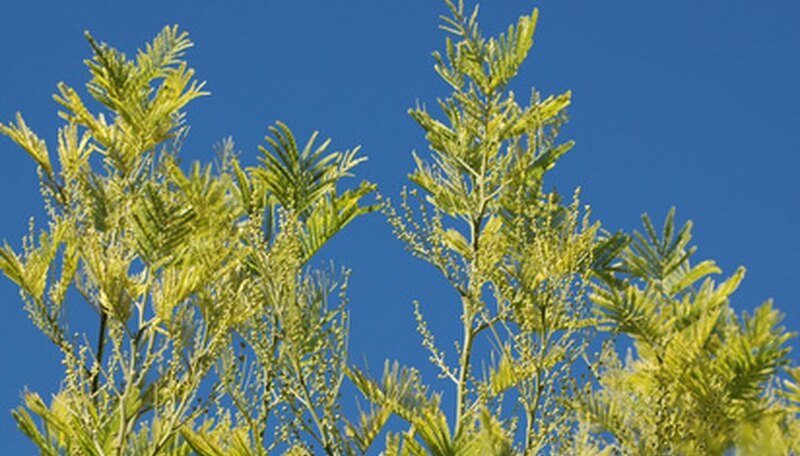 Fertilize the mimosa hostilis tree once a year, in the spring when the weather warms to over 65 degrees F. Apply a 10-10-10 formula fertilizer, at the rate suggested on the package, to the soil beneath the tree. Use a rake to spread the fertilizer out to the drip line (the soil that corresponds to the widest part of the tree's canopy). Water the soil to a depth of 4 inches to activate the fertilizer. Remove dead or diseased branches from the mimosa tree in early spring, prior to the tree producing new growth. Small branches can be cut off, at the point of origin, with pruning shears or loppers. Thick wood will require the use of a pruning saw. Mimosa hostilis roots can become invasive. Don’t plant it over underground structures that can be harmed by the roots.